This year for the first time we decided to make elderberry syrup. I'd not held much respect for those tiny berries which to me previously represented missed opportunities; elderflowers are such magical, frilly doilies of flavour and even despite a careful harvest some inevitably have turned before picking. The last attempt we made to use the elderberries was in vodka a couple of years ago and the drink was just about ok but nothing you would yearn for, even after a stinker of a week. It was a whim to pick the berries which had encouragingly hung over our fence from a neighbouring garden. There was a cascade of them, all ripe and ready to be used. Why not give it a try? 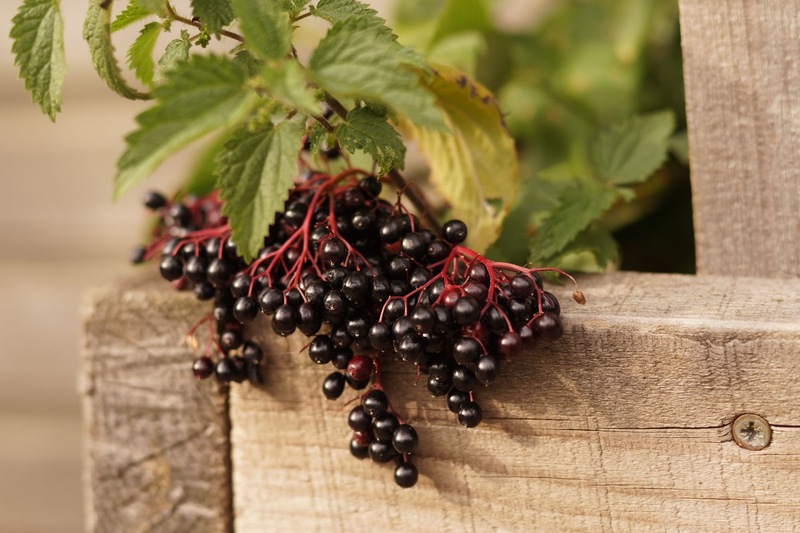 Elderberries, like rosehips, are packed with vitamin C and really pep up your immune system. As a cold-loather, I'll do anything more or less to dodge getting ill. The recipe was simple enough (although I slightly forget it now that I'd like to pin it down) but the rinsed and de-stalked berries were popped in a pan, just covered with water, simmered for a little while, I'd guess 20 minutes then strain and return the liquid to a clean pan, add the same volume of sugar. Heat to dissolve sugar, then boil a little before popping it into sterilised bottles. ALTHOUGH I STRONGLY RECOMMEND YOU FIND A PROPER RECIPE INSTEAD OF MY GUESS OF WHAT I DID!!! Don't forget that you must be crystal clear about what you are picking when foraging. 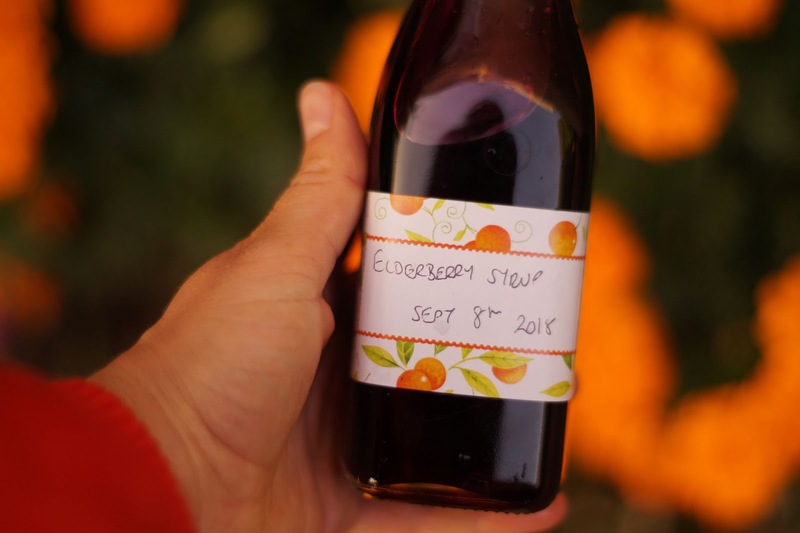 What does elderberry syrup taste like? Hard to describe but absolute heaven! The sugar makes it deliciously sweet but the fruity flavour of the berries is a wonderful revelation. I've been having a spoonful each day, what a chore. I imagine it would be perfect on ice cream, rice pudding or yogurt. Our batch is a runny syrup - one year we made a syrup, albeit with rosehips, which was so thick it was almost solid which is no use at all. 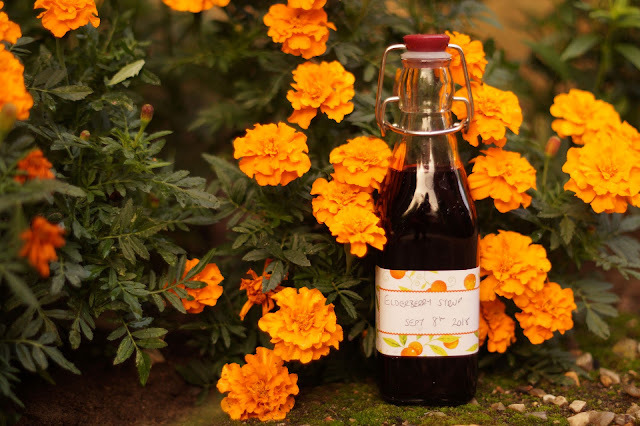 My syrup bottle is pictured alongside marigolds as they are one of the only colourful things left in the garden at the moment. Have you tried elderberry syrup? I'm won over and this will be a 'priority make' in future years. Love the idea of this stirred into rice pudding or porridge for a winter warmer. Yum!! I made elderberry gin a few years ago, that was nice! 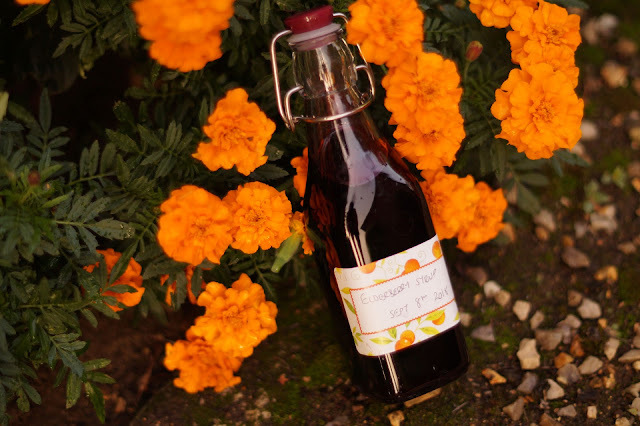 If it's nicer than rosehip syrup I might have to give this a go next year.